The new Wilson Hyper Hammer 120 has a stronger frame construction and extra versatility which, coupled with the flattened head shape, ensure maximum power and feel, even from those tight wall shots. The Power Holes technology succeeds in providing the player with 25% more power on off-centre hits. The Hyper Hammer Technology, combined with the Hyper Carbon frame, makes this racket very stiff, which contributes to its power with the added benefits of superb stability and an increased sweet spot. It should also be noted that the control on shots is amazing. HAMMER Technology - HAMMER Lightweight rackets with mass in the head provides great manoeuvrability with the added benefits of superior stability and enhanced power. 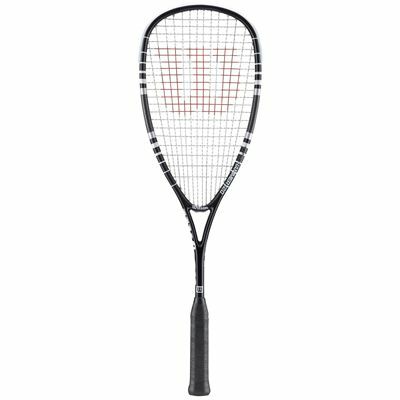 for submitting product information about Wilson Hyper Hammer 120 PH Squash Racket - Black We aim to answer all questions within 2-3 days. 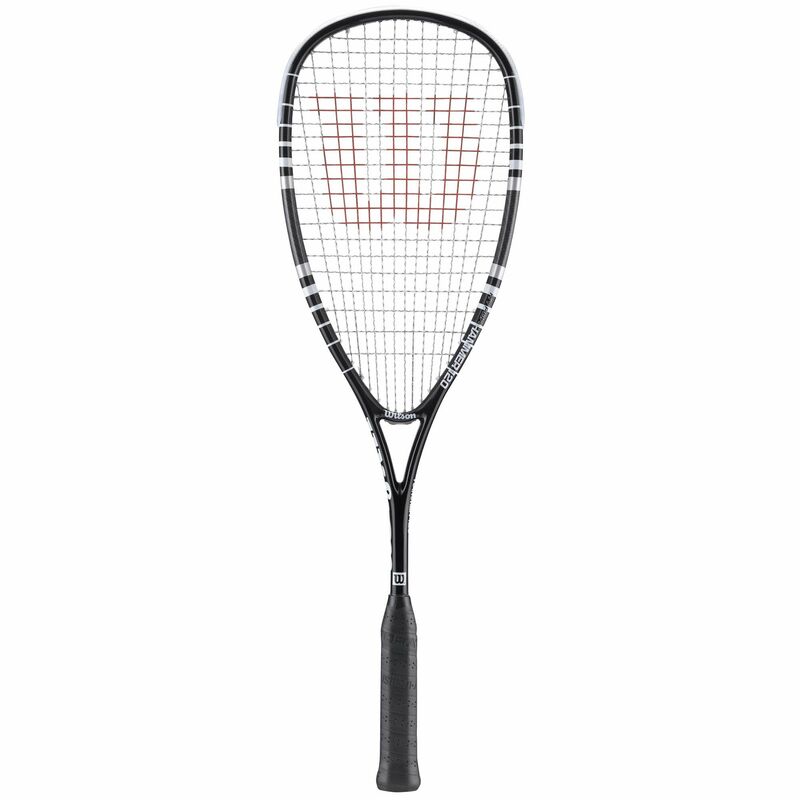 for submitting product information about Wilson Hyper Hammer 120 PH Squash Racket - Black. We aim to answer all questions within 2-3 days. If you provided your name and email address, we will email you as soon as the answer is published. Does this come with a cover? Yes, it does, a cover that covers the head of the racket. Is the racket supplied with a racket cover? Yes, head cover which covers head (stops at throat). great racquet - as can be seen as they keep making it! Excellent racket. Previously only played with Prince rackets but they kept breaking, this seems more study and has good power. I'm a beginner and this feels perfect. No complaints. I have been using this racket for years and love it! Good value. a very well balanced attractive racket. Great weight, and big sweet spot. bought 2, 1 via Amazon costing £10 more from same supplier. Should have done my homework. Love it! Feels very comfortable and swings great. I am a beginner/intermediate player and was surprised I could actually feel the difference with my previous racket. I love this raquet I've had other raquets but I always come back to this one. I really like this racket normally and have been playing with these rackets for many years - usually order 2 at a time and probably get restrung twice in the lifetime. I probably go through 2 or 3 rackets a year but play 5 times a week. The last one managed only 3 weeks of play before the frame cracked (often goes in the same place when it does go) - I will still order again and see whether just bad luck as there was no impact when it cracked. Very good racket. I particularly like the head heavy balance. The product is great and was dispatched promptly. The delivery company they use, Yodel, are utterly horrendous. At one point of enduring their ‘customer service’ it was suggested I go to the courier’s home address to pick up my parcel. Let the irony of that sink in. Great upgrade for my previous racket and reasonably priced, light and durable and forgiving in all the right places, for a beginner. Bought for grandsons birthday as he has taken up squash.He loved the racket. Excellent racket for the price. for submitting product review about Wilson Hyper Hammer 120 PH Squash Racket - Black.